Have you ever gone to the gas station and felt like you’ve just been held up? You stand there, pumping the gas yourself, watching the numbers click away. Ten, twenty, thirty, forty, fifty dollars…all getting sucked down the throat of your fuel tank in mere minutes. 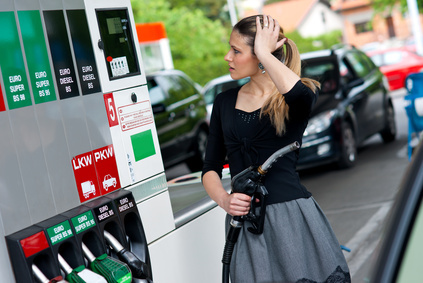 Pumping gas is kind of like being in an elevator. Nobody talks or makes eye contact. Maybe we are too embarrassed watching each other handing over large pieces of our paychecks in public…voluntarily. Oh, the shame. It got me thinking about a time when gas was not such a significant part of a family’s budget. If you look back to the early 1970s, gasoline was 35 cents a gallon. THIRTY-FIVE CENTS a gallon! That means a 15 gallon tank could be filled up for a $5 bill and you would still get change. Now, think about this. For less than $5, an attendant would pump the gas for you, check your oil, wash your windshield AND often times would give you a promotional item like a drinking glass, blow up dinosaur or trading stamps. Here’s something even crazier. They offered free air for your tires. Today, all we get is a smaller debit card balance and a $2 pack of gum. Of course today’s service stations DO offer fine dining options like roller hot dogs, enchiladas and frozen drinks bigger than your head. What the heck happened? Even as late as 1980, gas averaged just 86 cents a gallon. A big part of the explanation lies in the embargo of Iran in the early 1980s. While gas stayed below a dollar from 1929 until 1980 (a period of 51 years) it doubled in the four years from 1979 to 1983. I guess we showed them. To be fair it did go back down slightly in the late 1980’s, but after that, a dollar a gallon gas was just a fond memory. Even the next ten years remained fairly stable, with gas bouncing between about $1.10 to $1.25 per gallon through the nineties. In the year 2000 gas began its truly meteoric rise. That year it cost an average of $1.51 a gallon and we had already been trained to pump it ourselves. No oil checking, no windshield washing, no free air. The roller dogs had taken over. Gas in the 2000’s went from $1.51 to $2.79 per gallon. Today, we have now likely seen the last of fuel for under $3 per gallon. We have however, not likely seen the last of roller dogs. You can review the entire history of gas prices from the government here. We have no resources for the future of roller dogs.